Transparency Market Research has released a new market report titled “Automotive Multi-domain Controller Market - Global Industry Analysis, Size, Share, Growth, Trends, and Forecast, 2018–2026.” According to the report, the global automotive multi-domain controller market is anticipated to expand at a CAGR of about 74% during the forecast period. Automotive multi-domain controller are high-speed computing equipment that let the vehicle’s motorized system to process bulk data for automated driving. Automated multi-domain controller curtails the space, power consumption, and complexity of the electronic and electronic architecture by means of replacing numerous integrated electronic control units. It is considered as an alternate solution to the prevalent approach of tallying a dedicated electronic control unit for each and every new function, feature, and operation within the vehicle. Key transformation taking place in automotive electronic and electrical engineering, which impacts the electrical and electronic network architecture, is likely to affect performance, cyber security, and connectivity of the automotive, which is a key concern in the automotive industry. This transformation constitutes the amalgamation of multiple function-specific electronic control modules or units into a dedicated domain-based controller. This is a prime factor that is anticipated to drive the automotive multi-domain controller market during the forecast period. Furthermore, the advent of autonomous vehicle coupled with increasing number of connected cars and electronic components per vehicle, and fortification of mandates by governing and monitoring bodies for vehicle comfort, security, and safety are projected to boost the automotive multi-domain controller market during the forecast period. However, security of the automotive multi-domain controller supplemented with malfunction of the equipment is likely to hamper the automotive multi-domain control market in the near future, as one single mega electronic control unit leaves the automobile more vulnerable to cyber-attack as compared to other multiple electronic control units. This is likely to restrain the market during the forecast period. Based on application, the advance driver assistance system (ADAS) & safety segment leads the automotive multi-domain control market. This is majorly due to the high demand for safety and comfort while driving. Additionally, stringent safety norms and policies by regulatory bodies on security concerns have led to higher adoption of the ADAS applications, which has drastically impacted and congested the modern automobile system architecture. In terms of vehicle type, the passenger vehicle segment dominates the automotive multi-domain controller market. Increase in demand for vehicle electrification in passenger vehicles coupled with rising complexity and intricacy of electrical and electronic architecture in these vehicles due to increasing number electronic control units have fostered the development of automotive multi-domain controller for the passenger vehicle segment. The segment is projected to expand at a significant CAGR of about 72% during the forecast period. In terms of propulsion type, the hybrid vehicle is a rapidly expanding segment of the automotive multi-domain controller market. The segment is projected to expand at a CAGR of 79.72 % during the forecast period. This is majorly attributed to severe rules and regulations imposed to curb carbon emission by governing bodies and preference for environment-friendly vehicles. Moreover, incentives and tax credit offered on purchase of these vehicle has resulted in higher adoption of hybrid electric vehicles. This, in turn is expected to boost the automotive multi-domain controller market significantly during the forecast period. In terms of region, Europe leads the global automotive multi-domain controller market. Europe is projected to hold for around 44% share of the global market by the end of the forecast period. This is primarily due to the presence of prominent auto manufacturers and original equipment manufacturers in the region who continuously cater the automotive industry with improved and efficient solutions. 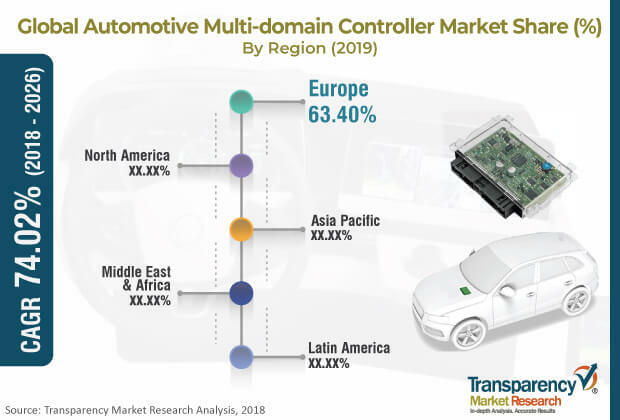 Consistent developments in technology supplemented with a higher rate of adoption and availability of electronic components are boosting the automotive multi-domain controller market in Europe. Major players operating in the global automotive multi-domain controller market include TATA ELXSI, Visteon Corporation, Robert Bosch GmbH, Continental AG, Sasken Technologies Ltd, Delphi Technologies, Mobileye, NVIDIA Corporation, Infineon Technologies AG, KRONO-SAFE, NXP Semiconductors, Autoliv Inc., ZF Friedrichshafen AG, and Texas Instruments Incorporated. Among major players, Visteon Corporation and Delphi Technologies account for a higher share of the global market.